This Athabasca Basin Explorer Is Positioned To Prosper During The Coming Uranium Renaissance | Energy and Gold Ltd.
One of the best ways to generate outsized gains in the junior resource sector is to own exploration companies when the sector makes its initial turn higher as it transitions from an extended bear market to a bull market. The potential percentage gains are significantly enhanced with explorers that have relatively tight share structures and sub-$50 million market caps. With the uranium sector in the midst of the 8th year of a grueling bear market most investors have given up after being fooled time and time again by false starts (bear market rallies). While everyone who has tried to call a bottom in uranium over the last several years has been early (wrong), there are a mounting number of signs that the next rally could result in the largest gains the sector has seen since 2010/2011. The global uranium supply/demand balance has become so tight that even a few million pounds of U3O8 production going offline threatens to swing the market to a deficit and in turn send spot uranium prices soaring. This market transition into deficit is occurring just as the United States has begun investigating uranium imports because “reduced production of uranium ore in the United States may be negatively impacting the military and energy sectors’ strength and soundness.” If this investigation goes as many industry observers expect it could, we will see large tariffs on uranium imports from potentially “adversarial” nations such as Kazakhstan and Russia. If this proves to be the case then uranium producers in close U.S. allies such as Australia and Canada could benefit tremendously. With only 7% of the uranium purchased by nuclear power plants in the U.S. last year produced domestically, it isn’t practical to expect all of the United States’ uranium needs to be supplied domestically. More U.S. uranium production will require two key ingredients: 1. Higher prices 2. Time. Cameco’s recent announcement that it will keep McArthur River and Key Lake shuttered for an indeterminate period of time, laying off more than 500 employees in the process, only serves to further exacerbate the looming undersupply of the global uranium market. Cameco will now also be forced to buy uranium on the open market in order to fulfill some of its contracts, adding significant near term demand to a relatively thin spot uranium market. With two powerful forces simultaneously intersecting (an undersupplied global uranium market and trade protectionism in the US) the stage is set for a substantial rise in uranium prices and the biggest beneficiaries could be North American uranium producers/explorers. The biggest percentage gains for investors are likely to come from explorers whose projects offer the most ‘optionality’ to higher U3O8 prices. 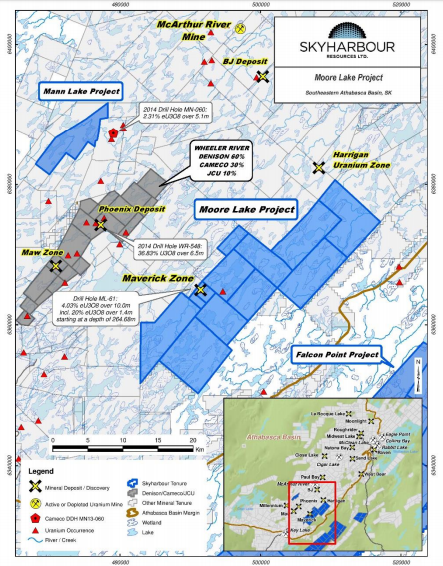 At the Moore Project Skyharbour has had several high grade intersections including: 6.0% U3O8 over 5.9 meters (including 20.8% U3O8 over 1.5 meters), 9.12% U3O8 over 1.4 meters, and 4.17% U3O8 over 4.5 meters. Skyharbour recently completed an Unmanned Aerial Vehicle Magnetometer Survey (“UAV-MAGTM Survey”) carried out by Pioneer Aerial Surveys Ltd. along the entire Maverick conductive corridor. The survey, which was flown at close 20 meter spacings and an elevation of 35 metres, has helped to better define cross-cutting features/structures which are high-priority drill targets. Skyharbour’s recent focus at Moore has been the Maverick corridor; four holes were drilled at the Maverick corridor during Skyharbour’s 3,400 meter winter drill program, three of which returned high grade uranium mineralization and successfully expanded the known high grade zones. The focus of the 3,000 meter summer drill program will be on drill testing basement-hosted feeder zones at Maverick. Skyharbour has an option to acquire a 100% interest in the Moore Project from Denison Mines and Denison is one of the largest shareholders of Skyharbour. Denison CEO David Cates also sits on Skyharbour’s board of directors. While Moore is Skyharbour’s flagship project, it is just one of six projects in Skyharbour’s Athabasca Basin focused project portfolio. This portfolio, which has been assembled during one of the greatest bear market downturns ever seen in a commodity, is poised to appreciate considerably during a uranium renaissance. Richard Kusmirski, Director and head geologist – As former exploration manager at Cameco with more than 40 years of exploration experience in North America and overseas, Richard is a guy you want on your team if you’re exploring for uranium in the Athabasca Basin. He has actively participated in the discovery of a number of uranium deposits and overseen uranium exploration projects in the Athabasca Basin for Cameco. Jim Pettit, Chairman of the board – Mr. Pettit has more than 25 years of experience in the resource industry specializing in finance, corporate governance, management, and compliance. He was previously Chairman and CEO of Bayfield Ventures Corp. which was sold to New Gold in 2014. Paul Matysek, Advisor – Mr. Matysek was the Founder, President and CEO of Energy Metals Corporation, which grew from a market cap of $10 million in 2004 to approximately $1.8 billion when it was acquired by a larger uranium producer, Uranium One Inc., in 2007. Mr. Matysek also has an impressive track record of being involved with companies that were eventually bought out an impressive premium including Goldrock Mines, Lithium One, Potash One, and Lithium X.
Skyharbour has assembled a team that knows how to win and its project portfolio is uniquely positioned to generate substantial shareholder value during the coming uranium renaissance. At a C$22 million market cap the potential upside is substantial considering that during the last bull market cycle there were multiple takeovers that took place at more than a US$1 billion valuation. During one of the most challenging time periods in the history of the uranium sector Skyharbour Resources has not only managed to avoid a disastrous shareholder dilution (which many companies have fallen victim to), but it has actually managed to generate significant shareholder value during the last few years. I believe this is a testament to Skyharbour’s management team and attractive project portfolio.